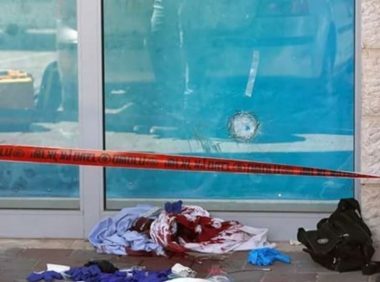 Israeli media sources have confirmed that the settler, who was stabbed at the entrance of a mall near Gush Etzion colony, in the southern part of the occupied West Bank, has died from his wounds. 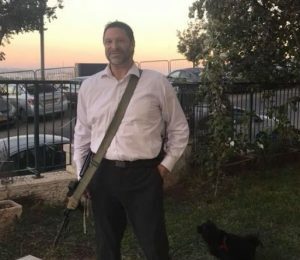 The man, identified as Ari Fuld, 40 years of age, died from serious wounds to his upper body at Shaare Zedek Medical Center, in occupied Jerusalem. Fuld was from Efrat illegal colony, near Bethlehem, in the occupied West Bank. The Palestinian, who reportedly stabbed and wounded the settler before he was shot, has been identified as Khalil Jabarin, 17, from Yatta town, south of Hebron. Israeli daily Haaretz said that, according to a source close to Jabarin’s family, the teen told his patents about his intention to carry out an attack in the Ibrahimi Mosque area in Hebron city. According to the Israeli National News, Arutz Sheva, said the wounded settler shot the Palestinian, who was also shot by a security guard and another settler. He added that resuscitation efforts were carried out for fifty minutes, but the man died from his severe wounds, and his family was informed. On Saturday, September 15, 2018, a Palestinian child, Soheib Abdul-Salam Abu Kashef, 16, died from serious wounds he suffered of August 3rd after Israeli soldiers shot him in Khan Younis, in the southern part of the Gaza Strip. 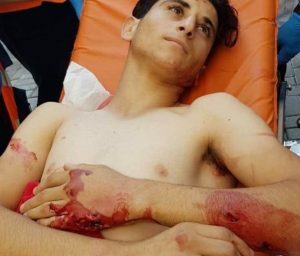 On the day of his serious injury, the Health Ministry said the soldiers engaged in the excessive use of force against the nonviolent “Great Return March” in Gaza, on its nineteenth consecutive week, killing a young man, identified as Ahmad Yahia Atallah Yaghi, 25, and wounding 220 Palestinians, including 90 who were shot with live fire. On Friday, September 14, 2018, the Israeli army Killed three civilians, including a child, and Injured 148, Including 19 children, five Women and five paramedics, the Palestinian Center for Human Rights (PCHR) has reported. They have been identified as Hani Ramzi ‘Afana, 21, from Rafah, Mohamed Khalil Ghazi Shaqqourah, 20, from al-Maghazi refugee camp, and Shad ‘Abed al-‘Aziz ‘Abed al-‘Al, 11, from Jabalia. Israeli sources stated, Sunday, that a colonialist settler was seriously injured, reportedly after being stabbed by a Palestinian teenage boy, at the entrance of a shopping center near Gush Etzion illegal colony, in the southern part of occupied West Bank. Israeli daily Haaretz, has reported that the wounded Israeli man, 40 years of age, suffered serious wounds to the upper body, before he was rushed to Shaare Zedek Medical Center Medical Center, in occupied Jerusalem. The Palestinian, who carried out the reported attack, has been identified Khalil Yousef Jabarin, 16, from Yatta town, south of Hebron. Israeli daily Haaretz said the Palestinian was shot by a settler, who was passing by, and suffered a moderate injury, and added that dozens of soldiers initiated searches in the Mall and the surrounding areas. The army also closed the southern entrance of Bethlehem city, preventing all Palestinian vehicles from entering or leaving it.